The High School Placement Test was designed by the Scholastic Testing Service (STS) and is used to appropriately select and place students entering into high school. The test evaluates students based on a variety of different major skill areas including math skills, verbal skills, quantitative skills, language skills, and reading skills. The HSPT is given twice a year, and its purpose is to help schools with the admission process, to match a student with the proper curriculum, and to determine scholarship awards. Your score on the HSPT plays a major role in the admission process, so getting a high score is of huge importance. Prepare with our HSPT Study Guide and Practice Questions. Print or eBook. Guaranteed to raise your score. Get started today! The exam is given by individual schools. Depending on where you choose to go, you will take the exam there. How do I register for the High School Placement Test? Because the High School Placement Test is given by individual schools, if you need information about how to register for the test, you will need to contact the school you are planning to attend. Additional details such as exam dates and times will also be specific to the school you are planning to attend. What if a test taker has a disability? Will accommodations be given? This depends on the school. Each school has its own testing policy in regard to what testing accommodations will be given, so it is important to contact your school of choice before the day of the test for more information. Price varies depending on the school. You will want to contact the school you plan to take the exam at for their specific price. However, the normal price ranges anywhere from $20 to $25. What are the different testing options? HSPT Flashcards. 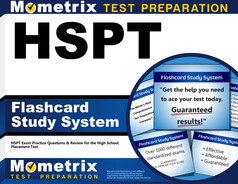 Proven HSPT test flashcards raise your score on the HSPT test. Guaranteed. Open HSPT: This option for the exam consists of schools purchasing testing materials and scores locally. This option also provides national normative measures in the five skill areas a student will be tested on. Pre HSPT: This option is for seventh-grade students. With this option, schools can lease Pre-HSPT materials and receive pre-HSPT standard scoring services. The school will also receive Student Performance Profiles, and Student Score Reports. The Pre-HSPT is also referred to as the closed HSPT. Large Print, Braille and audio versions: These are special materials and are available upon request. Who normally takes the exam? The exam is normally given to 8th graders going into private high schools. The exam is broken down into five different sections and consists of about 298 multiple-choice questions. You will have 3-hours to complete it. What will the HSPT test me on? This section of the exam consists of 60 questions and deals with logic, antonyms, synonyms, and verbal classifications. The reading section of the exam consists of 62 questions and deals with topics such as vocabulary, finding the main idea, and details. The mathematics section of the exam consists of 64 questions and focuses on basic geometry, arithmetic, and algebra. You will need to know proper math formulas, the order of operations, and measurement conversions. The language section of the exam consists of 60 questions and will test the student’s knowledge of punctuation, spelling, composition, and capitalization. It is important that you familiarize yourself with correct punctuation usage and rules. This section of the exam consists of 52 questions and tests your ability to solve reasoning problems that involve numbers and quantities. You will also be dealing with number series, number manipulations, and geometric and non-geometric quantitative comparisons. The verbal skills section and the quantitative section of the exam makes up your total Cognitive Skills Quotient, while the language, mathematics, and reading sections make up your total Basic Skills score. Will I lose points for guessing? No. The HSPT is scored based on how many answers you get correct. You will receive one point for every question you answer correctly. That being said, you should avoid leaving questions unanswered. There is no “passing” score for the HSPT. However, what you receive on the exam must fall between a certain scale, which is between 200 to 800. 200 is the lowest score you can get and 800 is the highest. In order to do well, you will want to score at least a 600. You will receive a composite score which lets your school know your total performance on the exam based on all five skill areas. Normative scores can be broken down into five different scores that include National Percentile (NP) Rank, which shows where you stand compared to other students in the same grade on a national basis; Local Percentile (LP) Rank, which compares your score to other students in the same grade at a local level; Grade Equivalents (GE) compares your performance with the average performance of other students at different grade levels; Cognitive Skills Quotient (CSQ), which is used to predict your future academic performance; and Standard Scores (SS) range from 200 to 800. Rank-Order List Reports: This report ranks students from high to low based on the composite scores they obtained. Pressure Sensitive Labels: This score shows the cognitive skills quotient (CSQ) of each student, as well as their standard scores, their national and local percentiles, and their grade equivalents for the basic skills section of the exam. Group Summary Statistical Reports: This report is a summary of an overall group’s performance on each subtest. The individual performance is also listed. Alphabetical List Reports: This report lists students in alphabetical order and goes on to provide cognitive skills quotients (CSQ), as well as standard scores, national and local percentiles, and each student’s grade equivalents for the basic skills section of the exam. How many times am I able to take the HSPT? It is recommended that you take the HSPT one time, so you should prepare as much as possible before your scheduled exam date. If you do choose to take the exam again, your lowest score will be reported. Are calculators allowed for the math section of the exam? Unfortunately, calculators are not permitted for the exam. You will be given scratch paper to work out any math problems. On the day of the exam, you will want to arrive at least fifteen minutes early. During the exam, it is important to listen and to read all directions carefully. Use scratch paper for any mathematics questions because calculators are not permitted. Answer every question to the best of your ability. Remember, you will not lose points for guessing. Pay attention to how much time you have for each section and pace yourself. Test proctors should announce how much time you have left for each section. Check your work if there is enough time left to do so. If you’ve been looking for a study resource that contains everything you need to know for the HSPT in a clear and easy to understand way, look no further. 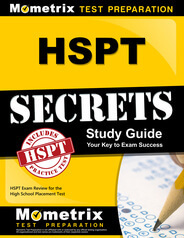 Mometrix Test Preparation is the perfect study resource for those looking to score high on their HSPT. Mometrix has designed both a study guide and flashcards that contain content and questions similar to what you will find on the HSPT. You’re also given sample problems to help familiarize yourself with the exam layout. The HSPT is a difficult exam to pass but choosing to utilize Mometrix as your study resource will help you take your exam with confidence and come out of it with a score you are proud of.